I had promised to make a wedding reception cake for a close friend a good two months before she needed it. Her son was to be married and she wanted me to make the cake for the reception to be held at a later time. A week before the party I fell while playing a little two on two basketball with the grands….I know right!?! I broke my right arm (had to be the right one) in 3 places. Now what in the world was I going to do… all hot pink casted up to my elbow? My friend was graciously going to let me off the hook, but I was determined to carry through for her. 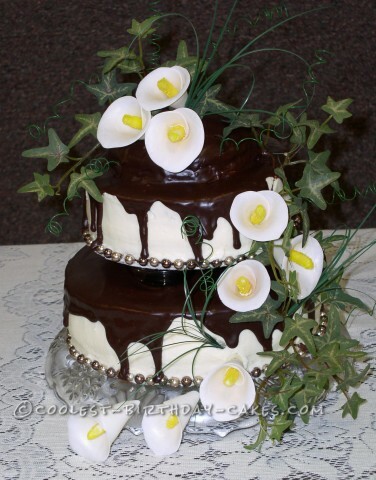 I had already decided to use calla lillies, but I had no clue how I was going to use the icing bag to complete the rest of the design I had in mind. I rolled out the fondant and enlisted my hubby and eldest granddaughter to be my extra hand so to speak. I rolled out the fondant and my husband used a heart shaped cookie cutter to cut out the lillies. I could still hold my arm and hand (painfully) in the positions needed to shape and secure each flower as well as dust each one with pink and ivory lustre dust. I formed the middles with fondant and brushed them with piping gel before dipping them in yellow sparkle sugar. The middles were stuck onto floral wires and then down through the middles of the lillies to complete them. My husband mixed up the white buttercream frosting while I instructed him step by step. He did great! My sweet granddaughter was busy getting this and that until we were ready to start the scary chore at hand (sorry…no pun intended). I iced the cake while my granddaughter turned it for me. Then it just hit me… GANACHE! I sent my husband straight to the store to get the ingredients… and… MAGIC! I drizzled it over each layer and it came down the edges perfectly. Now, a couple of strings of fake pearls, some silk greenery, and the beautiful handmade lillies were all put in place. The day was saved. Birthday cake idea posted by Glenda B.